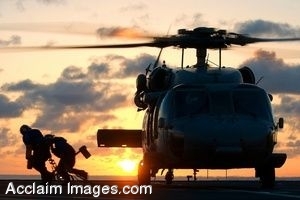 Description: Clip art photograph of hospital Corpsman Apprentice Stephanie Gomez and Hospital Corpsman Amanda Vasquez, working as flight deck handlers aboard the Military Sealift Command hospital ship USNS Mercy (T-AH 19), run clear after removing the chains from an MH-60S Seahawk helicopter. Mercy is deployed supporting Pacific Partnership 2008, a humanitarian and civil assistance mission building on friendship between partner nations and strengthening relationships of the past. (U.S. Navy photo by Mass Communication Specialist 3rd Class Joshua Valcarcel) Clipart photograph by Department of Defense Public Domain.